Apple Configurator 2 makes it easy to deploy iPad, iPhone, iPod touch, and Apple TV devices in your school or business. Use Apple Configurator 2 to quickly configure large numbers of devices connected to your Mac via USB with the settings, apps, and data you specify for your students, employees, or customers. Rebuilt from the ground up, Apple Configurator 2 features a flexible, device-centric design that enables you to configure one or dozens of devices quickly and easily. Simply select a single device or many at once and perform an action. 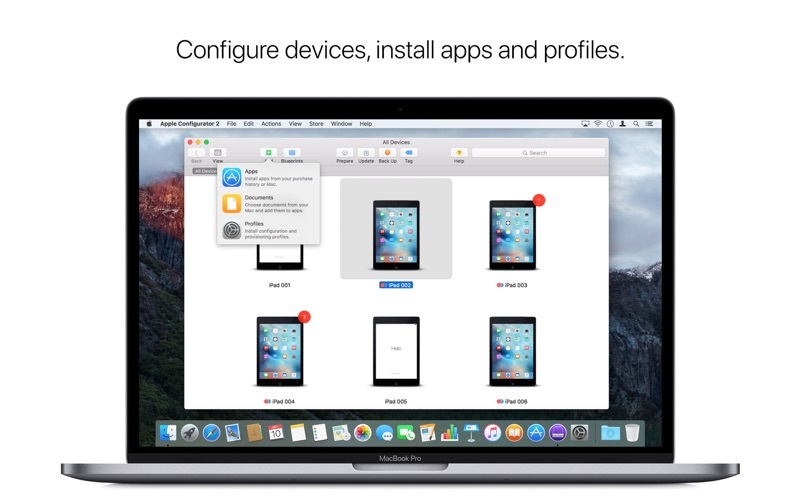 With Apple Configurator 2, you're able to update software, install apps and configuration profiles, rename and change wallpaper on devices, export device information and documents, and much more. 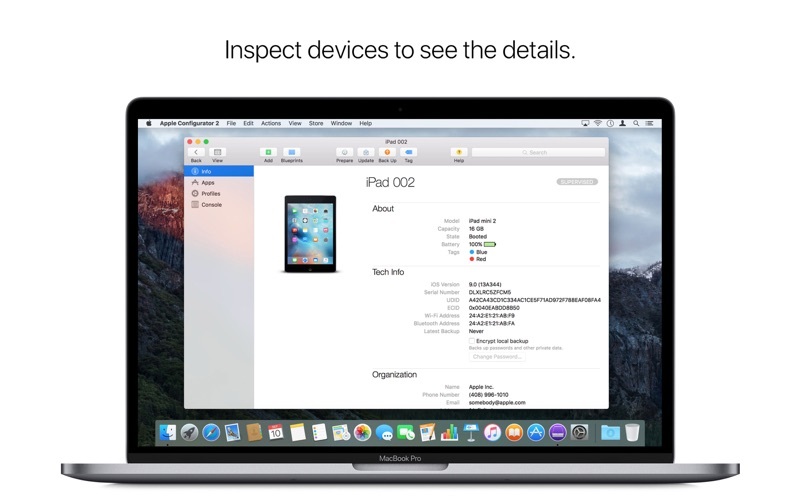 You can also inspect any device to see details like serial number and hardware addresses, which apps and profiles are installed, and its console log. Apple Configurator 2 integrates with the Device Enrollment Program to automate MDM enrollment as well as the Volume Purchase Program to seamlessly distribute apps from the App Store. The all-new Prepare assistant makes it easy to supervise and configure a cart of iPads for the classroom or quickly enroll a large number of devices in your MDM server for ongoing management. 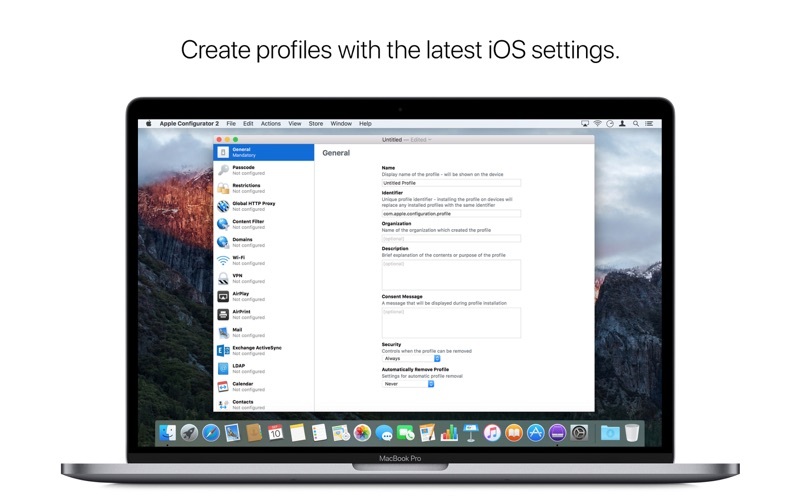 The built-in configuration profile editor supports creating and editing profiles with the latest iOS settings. If you’re configuring devices in an environment where consistency is critical, Blueprints allow you to create a custom configuration for your devices that can be applied with one click. 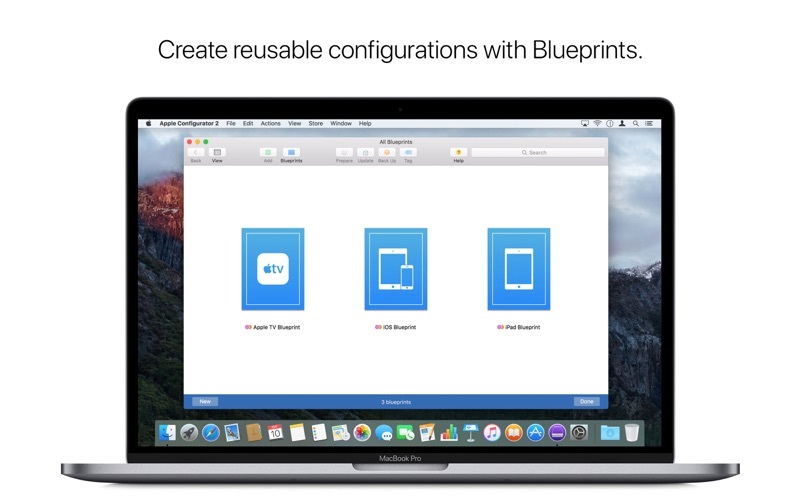 A Blueprint is a template device to which you add configuration profiles and apps and perform actions, just like you would to a connected physical device. 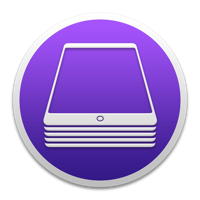 Fully automate Apple Configurator 2 and integrate its capabilities into your existing device management workflows using the included command-line tool, AppleScript scripting library, or Automator Actions. Support for iCloud Drive enables you to keep your configuration profiles and other settings consistent across multiple Configurator stations. Please add a feature to downlaod iOS apps to macOS local storage, so they can be scanned by my Anti-Malware clients! I want to at least make sure they're safe before I install them! I'm only using this application to try to rearrange my iphone screen, but it's impressively difficult to do that. It was difficult to find where I could edit the screens in the first place. I've accidentally cancelled my work 3 times, and a lot of things that seem like they should be easy (like ungrouping applications) I'm still lost on. This application could definitely use some UX love if it's the only way (besides on the phone itself, which is incredibly time consuming) to re-organize iphone screens. Works fine but NOT as functional as iTunes used to be. Before the PRO fans start slamming my review... I reviewed both postive & negative reviews before downloading this app and BOTH were helpful. I am a Game Developer and have HUNDREDS of Games & Apps on my various devices. The older versions of iTunes made it extremely easy for bulk folder and icon organization. Apple Configurator 2 offers 30-40% of the same functionality but has real UI/UX issues and isn't at all user friendly at launch (no on-boarding at all). 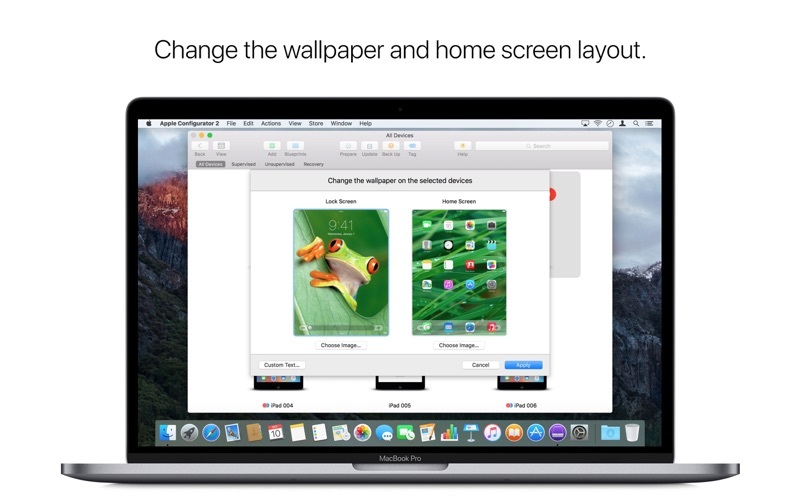 The PRO's & CON's: 1) Actions > Modify Home Screen - 2 clicks away from the key action needed for organinzing lots of apps. This should be the main screen (not the screen that randomly shows ALL apps). Once you know where it is (thanks to a Reviewers comments) it's fine but you have to reload this screen for EACH Folder update. 2) Home Screen Popup - Another reviewer mentioned this: the bottom row of icons are cut off (it resizes AFTER you modify something but reloads cut-off images after the user Applies any changes). Icons are really small and the popup window is locked at one size and can't be enlarged (no matter how large your monitor is). 3) Organization is limited to 1 screen at a time - I have multiple Home Screens fully loaded with Folders full of Games & Apps . Configurator allows me to modify 1 Folder at a time but I can't move apps OUT of the current Folder and into another Folder. I can't move Home Screens around and individual icons don't automatically shift around if I move more icons than space allows (iTunes allowed this). 4) Lacks fluidity & features of original iTunes app - this is THE key issue. Basic features still available in iTunes 8 (we're on 12 now) don't exist in Configurator 2. It allows for basic organization of items but bulk adjustments require a LOT of back-and-forth between Device & Configurator to get things done faster. In short: this app does the BASICS but Apple spent a lot of time training users on the iTunes functionality and Configurator falls far short of that. What it has works fine (and is probably great for IT professionals) but it's nowhere near the level of Apple's original functionality for every day users. If this is a Business App then great...if this is intended for the millions of users Apple abandoned when pulling the functionality from iTunes then it falls VERY short of the former product. Learn the App before you give it bad marks! It is the best mobile device management app for iOS devices! And it’s FREE! so I don’t get why so many people hate this app. I can't even add a device. Do I have to have a iPad 2? This works great when used with an MDM solution. If you are trying to use this to make your personal device look pretty that is not the programs intended use.